Randy Seaver has this week’s Saturday Night Genealogy Fun posted. The question for tonight is “What is your very best genealogy day ever?” Ever is such a long time. Truth be told, there were many best genealogy days since I began researching in 1990. I’m going to tell you about the first time I found “my people” in the census. It was a very good day, indeed. My local public library had a genealogy section. This amounted to 3 shelves of books crammed in next to the map section. Maybe two of the books had anything to do with California genealogy. There were two microfilm readers up against the back wall of the library. I was new to genealogy, but knew enough about my relatives to be dangerous. I had yet to learn of the glories to be found in Cal State Hayward’s newspaper archives and I wasn’t aware of the Family History Library in Oakland. I became a member of the National Archives Microfilm Rental Program (yep, there was such a thing!). Without any sense about what I was doing, I ordered the microfilm for the 1910 census for Oakland, Alameda County, CA. If I remember correctly, this was more than one microfilm. Having never dealt with microfilmed records before, I thought this would be easy. You can laugh at my ignorance. The Reference Librarian was kind enough to show me how to load the microfilm on the reader. Then, for the next several hours I spun wheels…mine and the reader’s. I flipped through township after township until I found what I was looking for: Brooklyn Township. Then, came the hard part. I knew that my ancestors and their relatives lived on E. 25th Street in Oakland and that the street was located in Brooklyn Township. How was I to know this would spread over many, many sheets? Yeah, I was that green! And, then…it happened. I found one of the families I was looking for. Below them, I found another. I rolled up another sheet and there were more families. And, there were my great grandparents, Theodoro and Maria (de Braga) Pacheco under the names they had taken to escape Hawaii: Theodoro and Maria Smith. 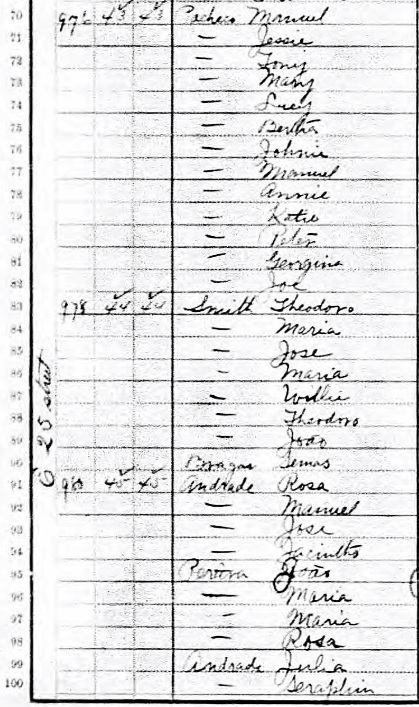 Theodoro’s brother Manuel is listed above him and the people below are relatives. I sat back in my chair overwhelmed at the enormity of it all. These were my people. These were MY people! Just like everyone said…they were right there on E. 25th Street. I got goosebumps and a smile spread across my face. I may have even said something completely inappropriate and much too loud for the quiet library atmosphere. Good thing it was 2 pm on a week day and school hadn’t let out yet. All be damned. There they were! Up until then, my relatives were in the abstract. They were a collection of names, dates, and places that I had written down on note paper during phone interviews and transcribed from letters. I’d dutifully copied them onto my family group sheets and pedigree charts. But, those were other folk’s memories I was stealing and they needed to be confirmed. This moment was mine, all mine. It was my first attempt at real research and I found them. I had the tired, red eyes to prove it. My people. This was the moment they became real to me. I have had many goosebump moments, many epiphanies, and many documents that changed “everything” in the last 25 years. But, this was the my first attempt at real time research. Finding my relatives exactly where they were supposed to be was an amazing moment. It is one I will never forget. I just had one of these moments a couple of days ago when I was able to get my hands on some of my maternal grandmother’s old photographs. In the box was a photograph on a cabinet card of my grandmother’s sister who had died when she was between 2 and 3 years old from the flu epidemic. It is the first time that I finally was able to see who this child was and then I found a photo of my maternal great grand mother! Both my great grand mother and her daughter died of the flu, or at least that’s what I’ve been told and up until this time I had no idea what they looked like. Thanks for writing about genealogy! Isn’t amazing when you finally get to see their faces? Suddenly your whole perspective on these people changes. They become so much more real. I’m so glad you found your maternal great grandmother’s photo! I’m so glad also! I’m having so much fun going through them all. Some are a bit of a puzzle as my grandma didn’t put full names on some of them, and some have their nicknames on the back, lol.